First of all thank you all for your comments and recommendations. I truly appreciate all the input, honestly getting recommendations from cooks who like me use their appliance on a daily basis is worth more than any advertisement or review so thank you. My head was swimming, reading about the different products on the market, the reviews etc… it became very confusing so I stopped reading reviews and concentrated on what you all recommended along with the facts about the machines. I set a budget of $300. Right now with all the Veterinary visits etc.. the amount I could spend was limited. I am sure any of you with pets can attest to how expensive it is to visit the Vet, the tests and office visits and meds are mind boggling and Nando is still struggling and at the Doc’s almost every week. I wanted a machine that was powerful approximately 1000 + watts. A good track record, not asking for perfect good is fine. My first choice was a Vitamix but the model I wanted was almost$700. I probably could have stretched my budget and gotten another model but thats the one I want. 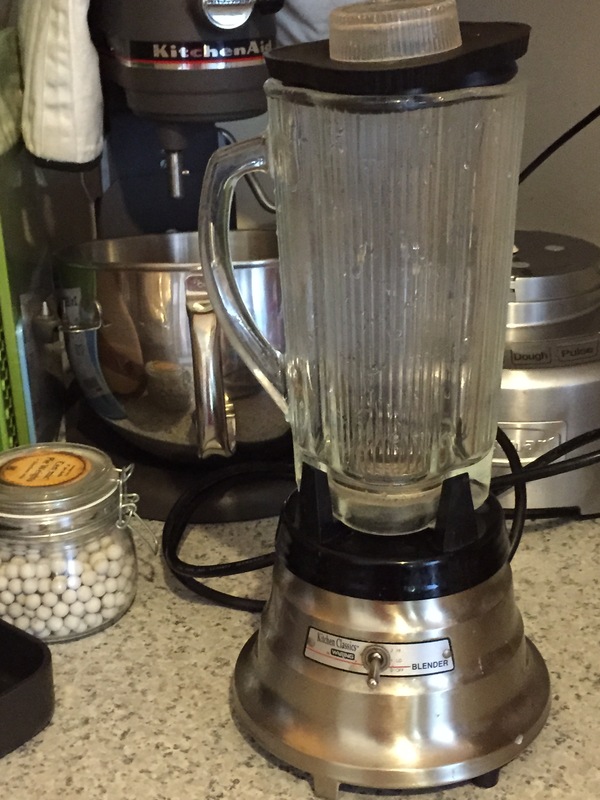 The other blenders I considered were the NutriBullet, Breville Hemiphere, Kitchen Aid Torrent. I would like to have purchased from Williams Sonoma because I love their fantastic customer service, it’s the best bar none. The NutriBullet is a great machine but the carafe is not large enough for my purposes and the RX has a heating element which I didn’t want or need. I almost purchased the Breville but the Hemisphere got mixed reviews and I just wasn’t sure it was for me. The Kitchen Aid Torrent is new, I love Kitchen Aid my stand mixer is so good and reliable but I decided with a price tag of $449-$599 depending where you got it was not in my budget and if I am going to spend that much I’ll just get a Vitamix. The other machine that receied some good to great comments was the Ninja, it seemed to have everything I was looking for and at a reasonable price. 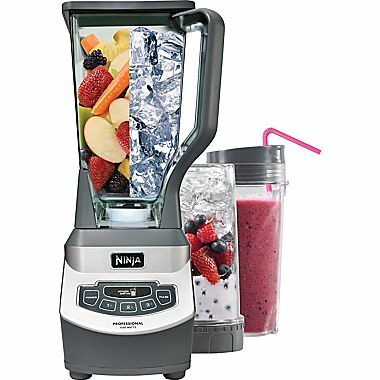 I decided to buy the Ninja Professional, it has 1100 watts, a 64 ounce carafe and two individual small cups for my smoothies. It has everything I wanted, power, size, versatility was only $139 so less than my alloted budget, so here’s hoping I like it. I am excited to give it a go, it arrived today. Thank you all for your great advice and recommendations. 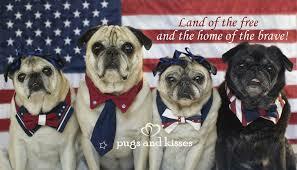 This have been really busy here, taking care of Nando, out of town company, my cousin and her kids are here visiting. This will be short and sweet. My Waring blender which has served me well for many years has finally died. I need a new blender. I am asking for recommendations from you. I have been thinking about a vitamix but not sure I need it, I want it to be powerful and efficient and long lasting. What do you use? Would love to hear from you. There are so many out there, this Waring was a real work horse and lasted 12+ years. Thanks everyone! Has anyone used or heard of Smeg Blenders? Very cool looking but are they any good? This is a very special Fiesta Friday, we have lost a dear friend, Selma from Selma’s table succumbed to cancer on July 4th. I never had the pleasure of meeting her personally and only knew her through her blog, we exchanged a few emails she was encouraging me about my sour dough starter. 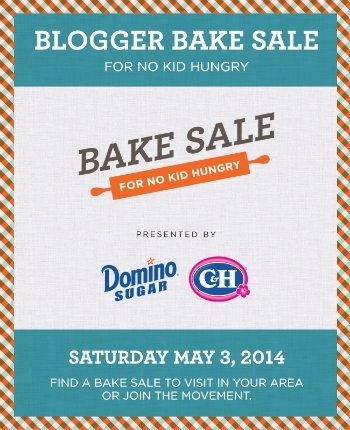 Her starter made it’s way around the blogging community, she was generous with her time and advise and talent. If you have never visited Selma’s Table please do, make one of her fantastic recipes and you will see what I mean when I say what a wonderfully talented cook she was. 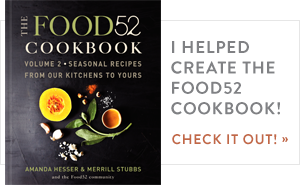 When the editors at Food52 found out about Selma’s passing they decided to post a tribute to her highlighting several of her recipes, look for it today on Food52 (here it is). This week along with Angie@The Novice Gardener/Fiesta Friday we are joined by Elaine@foodbod, Jhuls@The Not So Creative Cook, and Sue@birgerbird to remember Selma and honor her life as we cooks do best by preparing Selma’s recipes. If you would like to participate in this special tribute to Selma simply click on the link above, you don’t have to cook if you have a poem or anything that you feel celebrates Selma’s life it would be great. 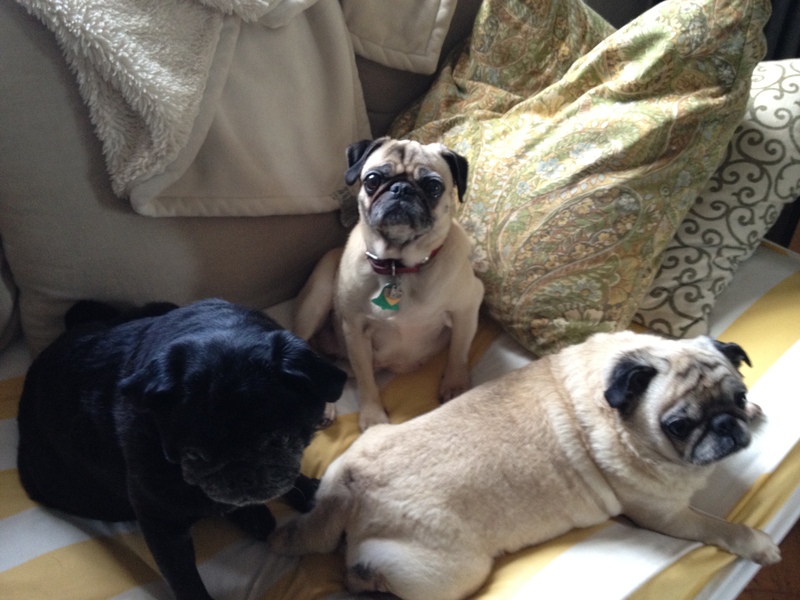 Selma, you were/are loved by so many and your presence will be sorely missed. Food52 Editors’ Comments: WHO: Divasparkle is an adventurous cook who hails from across the pond, in London. WHAT: A comforting one-dish meal with a sauce built in. HOW: If you’ve read the title of this recipe, you know the method — just marinate, roast, and eat. WHY WE LOVE IT: This is the ultimate dinner-party dish; it will taste like you’ve been working on it all day, but you’ll know the truth: You spent 10 minutes mixing the marinade and turning on the oven, and had the rest of the day to yourself. Tell them, or don’t; it’s up to you. The day before, rinse and drain the chickpeas. Peel the potatoes and cut them into 3 inch chunks. Give the lemons 30 seconds or so in the microwave to help release more juice, or roll on a flat surface while applying a little pressure. Slice in half and squeeze out as much juice as you can. Mix the marinade ingredients together in a medium bowl. Taste and adjust the seasoning. An hour or so before you are ready to eat, heat the oven to 200º C (375º F). Remove the bag from the fridge and tumble the contents into a roasting dish large enough for everything to be spread out. Season with salt and pepper. Cover the dish tightly with foil and cook for 1 hour. 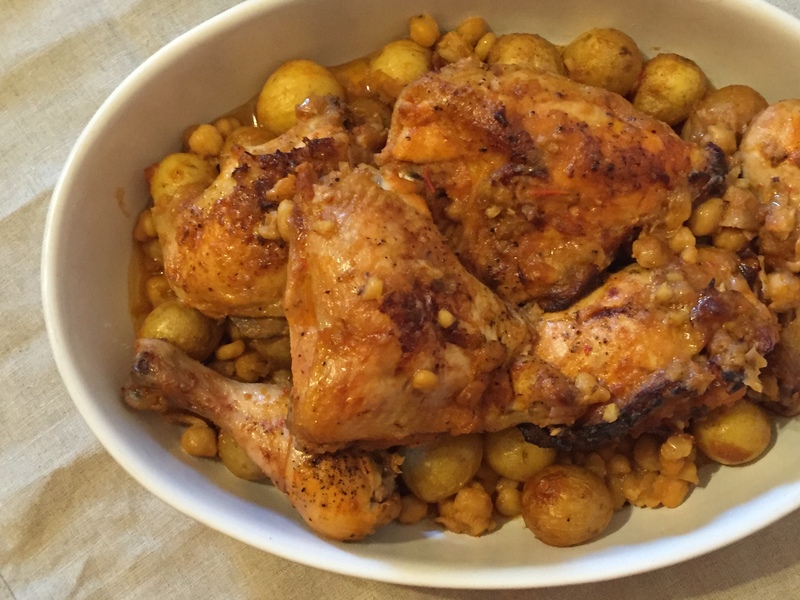 Remove the foil and cook for another 15 minutes or so, until the chicken skin and potatoes are crispy and cooked through, and the chickpeas get a little crunchy. Watch carefully to make sure the marinade does not go from gooey and delicious to a burnt crisp. Remove from the oven and scatter over the roasted cumin seeds and chopped coriander leaves. 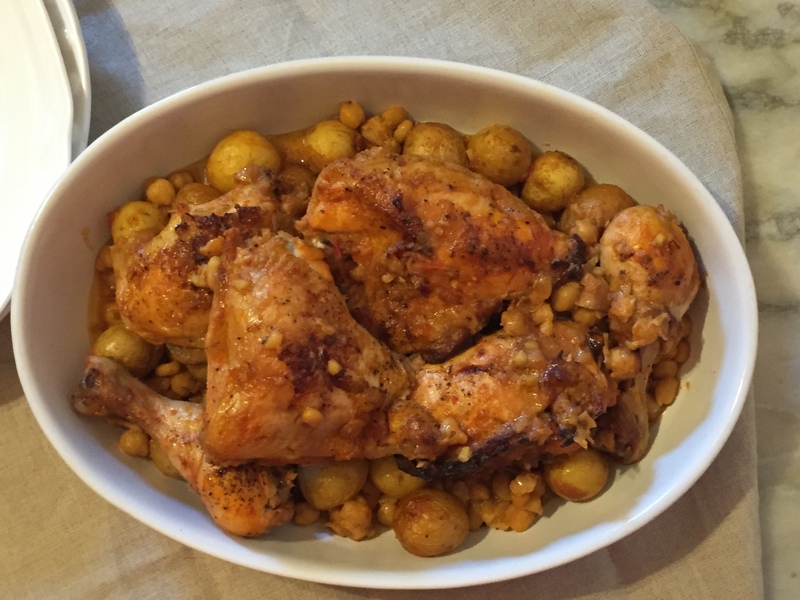 Serve with a dollop of Greek yoghurt or tzatziki on the side, and prepare to be worshipped. So many of you have kindly asked about Nando and the status of his wheels, thank you so much for your concern. We got Nando’s wheelchair but he cannot use it, it doesn’t work for him right now. He has been walking with his head tilted to the left and hanging down and when we attached the cart he went over in a somersault. He can barely walk right now, I took him to the Vet the other day who diagnosed IVD, Idiopathic Vestibular Disease or as she put it Old Dog Vestibular Disease. It turns out that he has a severe inner ear infection in both ears which could be the reason he falls and tilts to the left. He is on antibiotics both oral and in his ears. 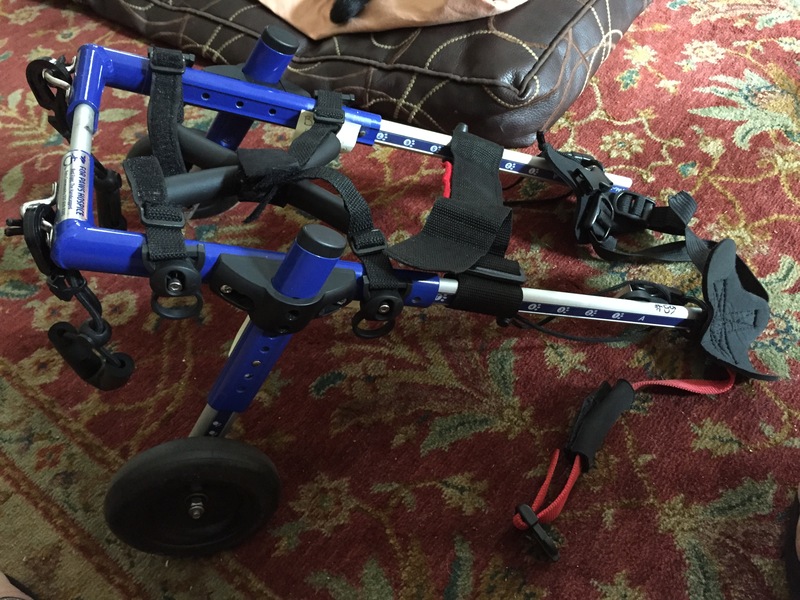 I contacted Harlan at Red Flyer and told him I would return the wheelchair but he said to hang on to it in the hopes that the antibiotics would help Nando so that he can use it. He was having a hard time before but now this has made things a hundred times worse and more difficult. Watching him try to move is heartbreaking and I honestly didn’t know what was wrong. 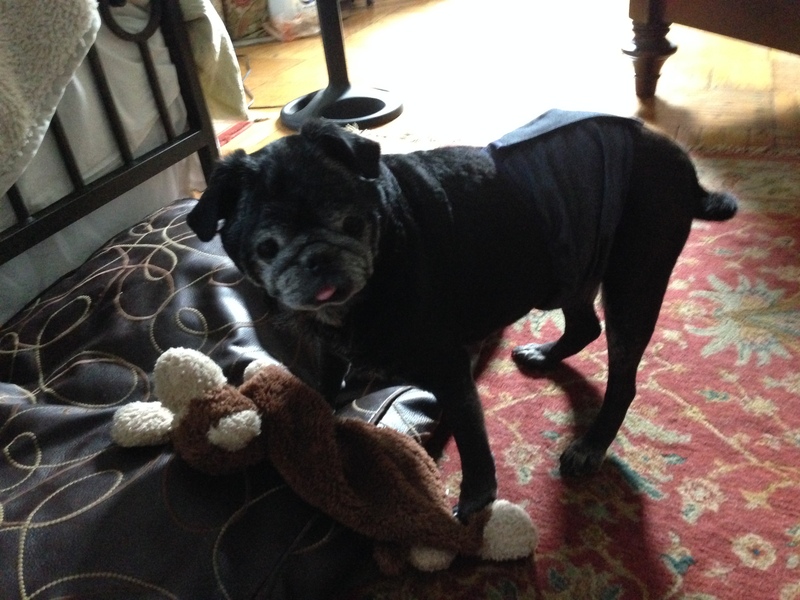 I thought maybe a stroke, He is struggling but keeps trying to walk, he is so determined. I have to hold him up to eat, he still has a great appetite despite all of this, Nando is my foodie pug. Keep him in your thoughts. I know so many of you knew Selma@Selma’s table and the sad news of her passing on July 4th. This is a terrible loss for us all, Selma was so much a part of our blogging community, I never even knew she was battling cancer, please participate in this tribute for Selma, see below for details. We are in the throes of summer and July is the month that at least for me is the quintessential summer month, it’s also the month that America celebrates it’s Independance on July 4th and the French celebrate Bastille day on July 14th. What better way to mark both holidays than with an American/ French food and wine pairing. 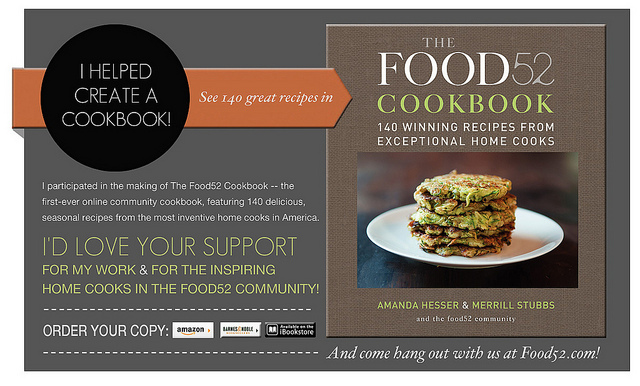 Michelle@Rockin Red Blog invited me to participate, I was thrilled but a little scared, I’ve done plenty of posts utilizing the expertise of the wine experts but have never actually done this myself. 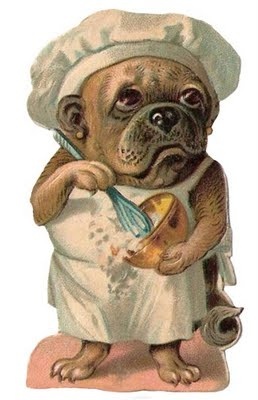 There can be any number of combinations, American food French wine, American food and wine etc….. 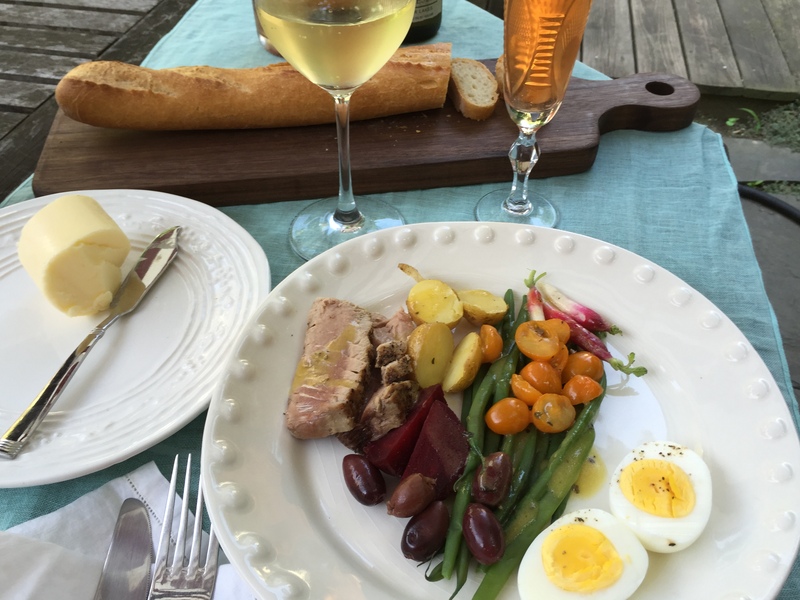 I chose a classic French dish that is light and IMHO perfect summer fare, Salade Nicoise, and I thought it would be fun to pair with both an American and French wine. Coat the potatoes in olive oil, season with salt and pepper and roast in a 375 degree oven for 25 minutes. At the same time roast the beets, clean well, drizzle with olive oil add a sprig of thyme and wrap in foil. Roast for 30-40 minutes. Clean and trim the haricot vert, place a saucepan filled with water on high heat to boil, add a tbs of salt to the water. When it comes to a rolling boil add the green beans and boil for 8 minutes. Immediately drain and place in an ice bath to stop the cooking process and the beans will retain their lovely green color. Make the hard boiled eggs. Clean the radishes and tomatoes. 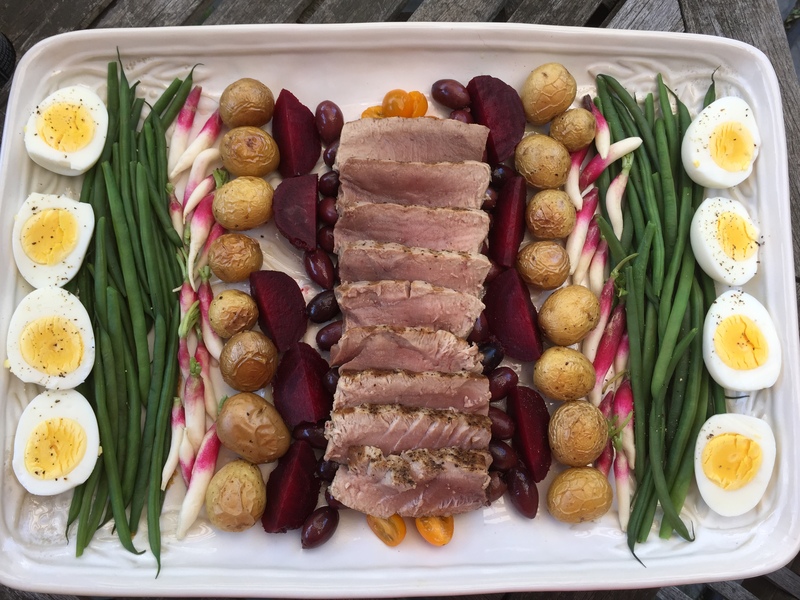 Prepare the tuna last, mind you all of this can be done ahead of time and assembled the day you are going to serve the salad. Place everything in a lidded jar and shake to combine. Heat fry pan with a little olive oil on Medium high heat (make sure it’s sizzling hot). Season the tuna steaks with salt and pepper (be generous with the pepper) Sear the tuna 3-4 minutes on each side (depending on thickness mine were about 1 1/2 inches thick) and immediately remove from the fry pan. Let sit 10 minutes and slice. 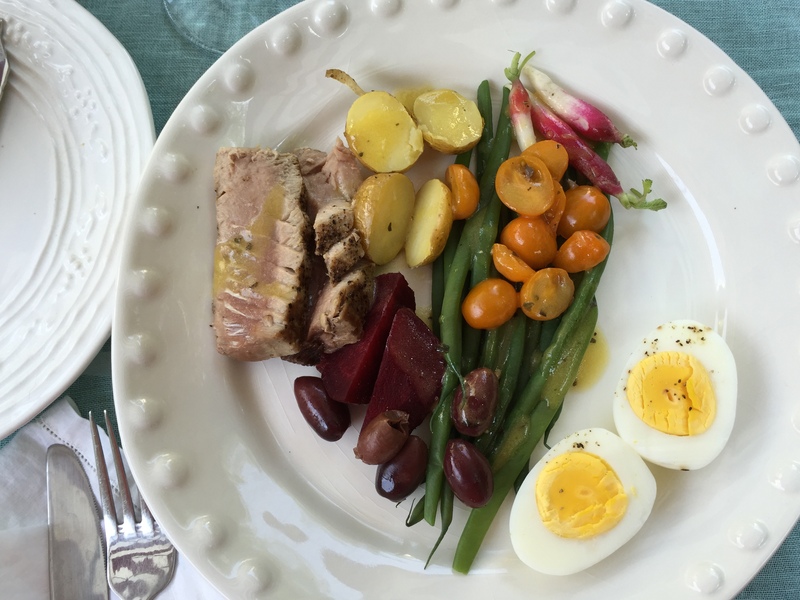 Arrange the vegetables and egg artistially on a platter, add the tuna slices and serve the vinaigrette on the side. I love wine and enjoy with my food but I am not a professional at wine pairings. I thought about what I was serving and what I would like to have with it, both the dry Reisling and Rosé Champagne came to mind. I did a little research and found that my instincts were pretty good. 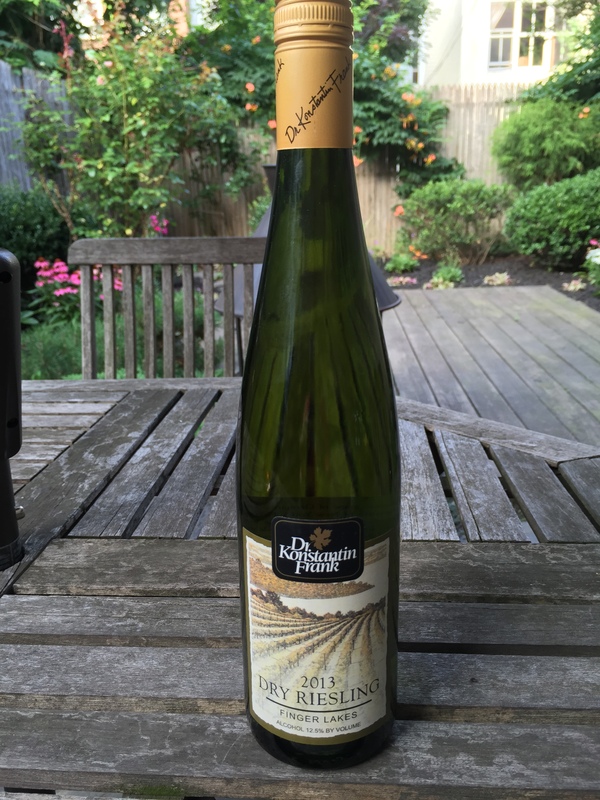 I thought the Reisling, especially this particular one from upstate New York is clean, crisp, and it would be a great match with the tuna. 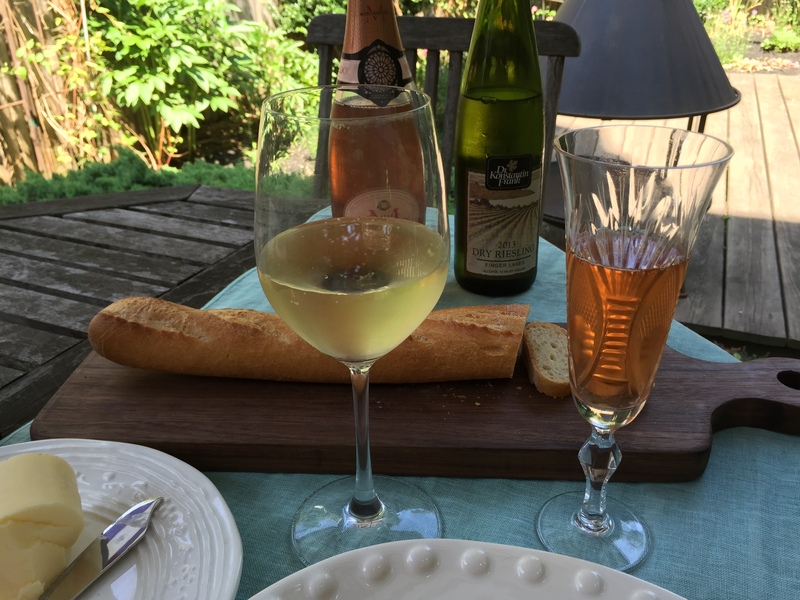 When considering the Rosé Champagne one usually thinks in terms of desserts or something sweet but Rosé and specifically Rosé Champagne is excellent with many and varied savory dishes from grilled meats to a Nicoise Salade. The Champagne also has a lively acidity and I felt that would be important when considering what to pair with this dish. Both wines were amazing and they were the perfect compliment to the salad. I first tasted the Reisling which is nicely dry, just the slightest hint of sweetness almost undetectable. It is a very distinct wine that was delicious with the meal. It’s very well balanced in both acidity and mineral content. The Rosé Champagne is I think one of the best I have had. 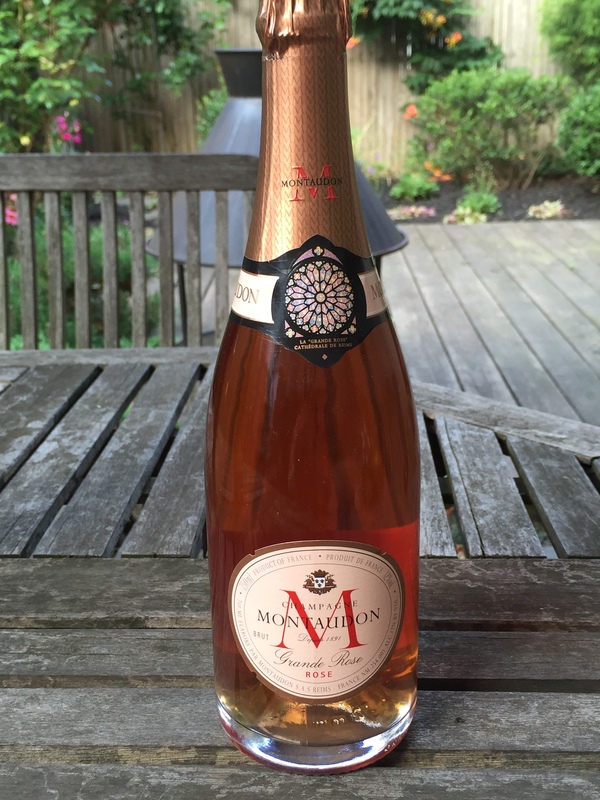 It’s a delicate champagne, a gorgeous deep pink, effervescant, crisp, fruity, slightly sweet and beautifully balanced. It went so well with the salad. I served ice cold. This Champagne would be fantastic with anything including dessert. If I had to pick one that was my favorite (and thats a tough one) I would have to say the Rosé Champagne wins my vote. I already ordered 2 more bottles. Please join us this morning at 10 am CST on Twitter for a fun and lively discussion on our American and French food and wine pairings at #WinePW. Also, join us Saturday, August 15 as we explore Portugal, a land of delicious food and outstanding wines! My favorite of all the summer produce is vine ripened tomatoes, they are starting to pop up at farmers markets now. 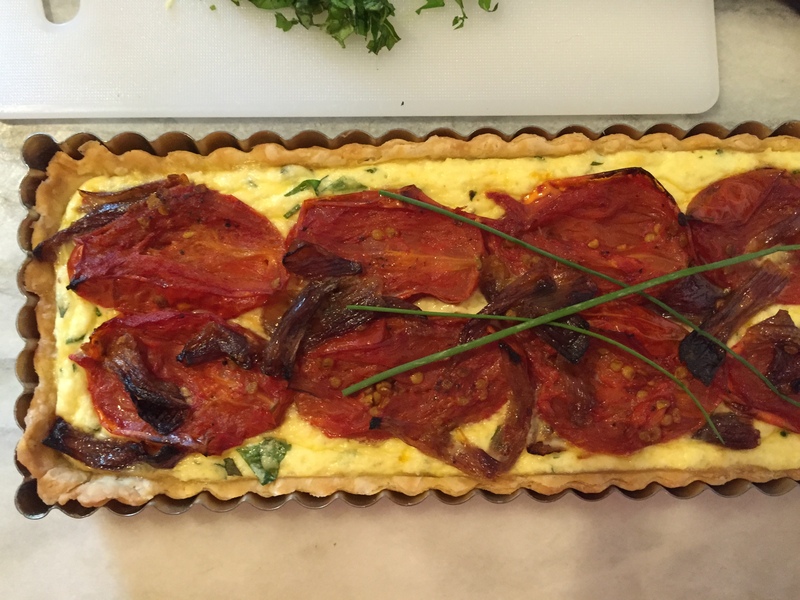 There is nothing like a fresh tomato and this was my inspiration for this summer tart. I found some home made ricotta at the market and thought it would go very nicely with oven roasted plum tomatoes and herbs from my garden. I used basil, parsley, chives and oregano, you can use whatever you have on hand or like. It makes a great meal with a simple salad. 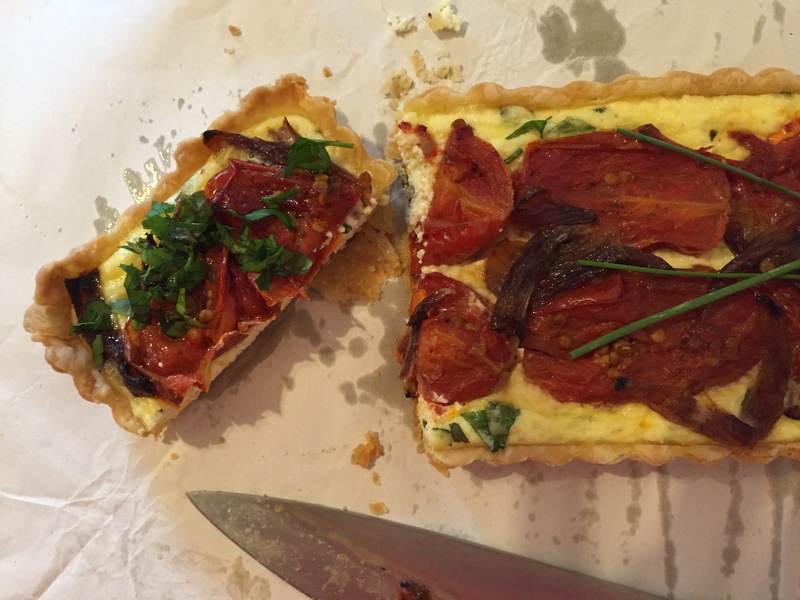 The filling is so light and although similar to a quiche it has a different texture and flavor. Don’t skimp on the cheese or herbs! 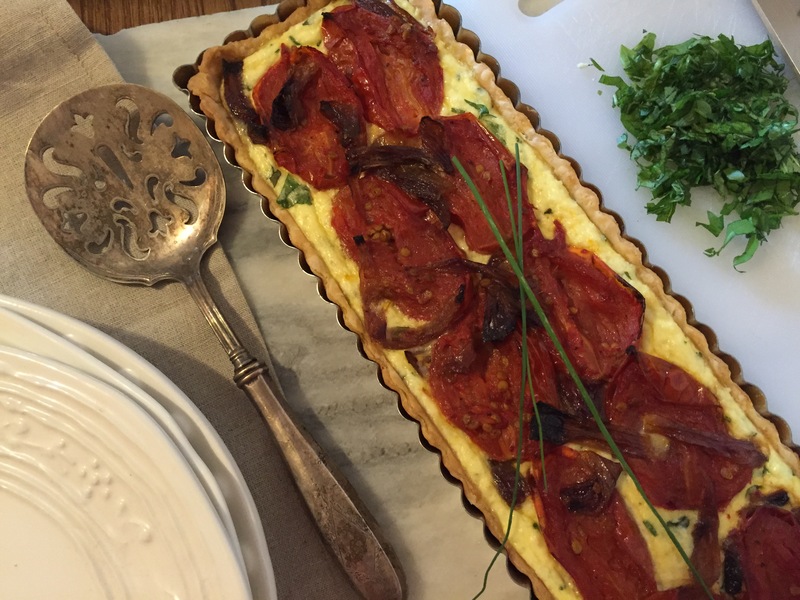 I am bringing this savory tart to the party this week! Angie@The Novice Gardener and Fiesta Friday are doing something a little different this week, the party is a quiet one, yes usually we are a raucous bunch but not this week. There are no designated co hosts, we are all the co hosts this time and there will be no features. I hope everyone enjoys this tart! Pre heat oven to 375 degree’s. Place pie dough (recipe here) in your tart pan, prick the bottom with a fork and place in the freezer for 15 minutes. 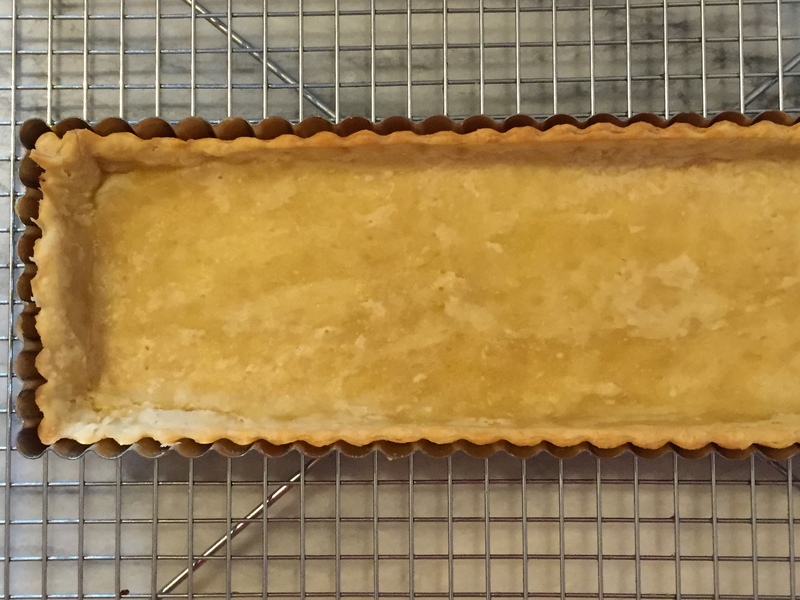 Place a piece of parchment or foil in the tart pan and fill with pie weights or beans. Bake for 25 minutes the crust will be light blonde you don’t want it to be browned, remove from the oven, and take the pie weights and parchment out. Let cool on a rack. Keep the oven on you will need it for the tomatoes. 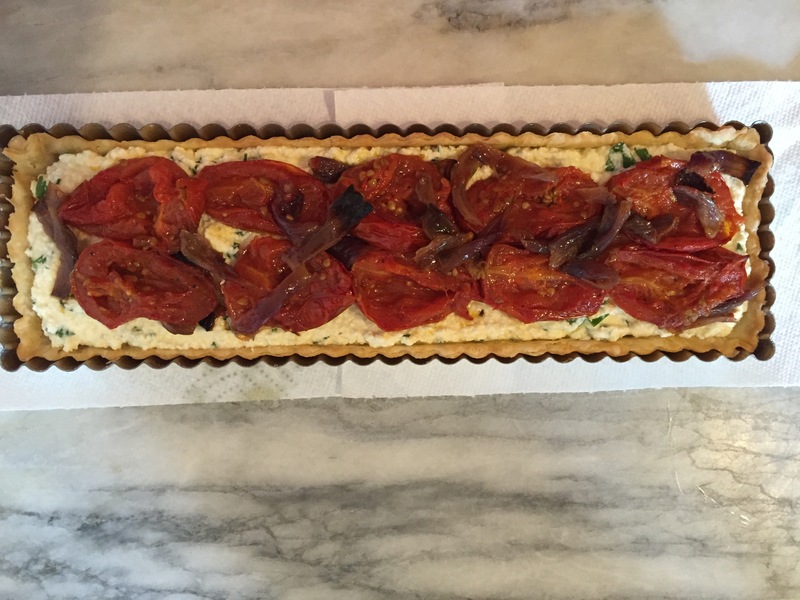 Place the tomatoes skin side down and shallots on a sheet pan drizzle with olive oil and season with salt and pepper. Roast in the oven turning the tomatoes over after 20 minutes, continue roasting for another 15 or 20 minutes until the tomatoes and onions are caramelized. Note: If the tomatoes give off too much juice pour excess off and don’t throw it away it can be used in another dish. My tomatoes were very juicy, I saved almost 1/4 cup of juice. When the tomatoes and onions are done remove from sheet pan and set aside. 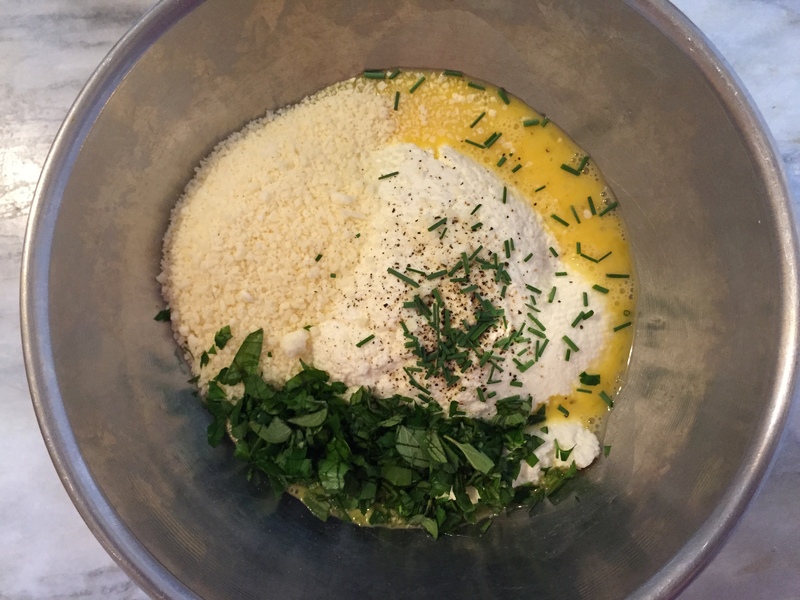 Place the ricotta, eggs, grated cheese and herbs, season with salt and pepper and mix until combined. Add the ricotta mixture to the cooled pie crust, arrange the tomatoes and onions on top and bake in the 375 degree oven for 30-35 minutes. Let cool on rack and serve room temperature. I like to drizzle a little olive oil on the tomatoes and sprinkle with some of the chopped herbs. NOTE: I recommend draining the rictotta for at least an hour before making the filling, you don’t want any water seeping out to make the crust soggy. I had a little ricotta that I didn’t use in a rectangular tart so you could use a about 1 1/2 cups if you don’t want leftovers. I used the leftover ricotta mixture with pasta, it was delicious.